Capcom Classics Mini Mix Box: Despite having 3 great games, this compilation is still a mixed bag.After trading in a few games, I had some credit at the local Gamestop available. 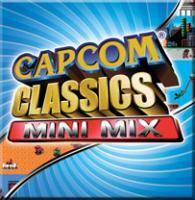 In an attempt to beef up my GBA/DS game collection, I got Capcom Classics Mini Mix for only $1! Is this fairly recent collection of retro games for the GBA worth it? The games are good, but a few niggling presentation issues keep it from what is should be. To be fair, the games included here are oldies but goodies and are were originally NES ports of arcade games that are heavily changed from the originals in effective ways. Strider adds some RPG elements, a plot hampered by a laughable translation, and Mega Man style stage selection to what originally was a fairly generic, but cool, side scroller. Bionic Commando is arguably the best of the bunch here with several levels, some lite RPG elements, and a plot that some how works in spite of censorship (the original villains in the Japanese versions were Nazis; for the American version, all swastikas were removed and the villains are now a generic evil army). Mighty Final Fight takes an ultra-cute kiddy approach to a remake of the first game of the series with a superfluous addition of having your characters level up.